The market for Classical and Egyptian antiquities is thriving, with artefacts of interesting and long-established provenance remaining highly sought after. It is clear that 2009 was a better year than 2008. It would be hard to repeat the bad publicity generated by the sale of the Geddes collection in October 2008. But how do you define "interesting and long-established provenance"? Is it possible to trace the collecting histories for items in the forthcoming sale back to 1970? Robert Brooks, the chairman of Bonham's, made a statement in the wake of the "Geddes affair" : "we would welcome a greater openness on the part of the Italian Government". But what about the greater openness of Bonham's? So what about the collecting histories of the three limestone Roman funerary busts that are in the April 2010 auction? Where did they reside between 1970 and 1998 (when they surfaced on the London market)? The period 1998 to 2010 is hardly "long-established". Do the pieces have an "interesting provenance"? 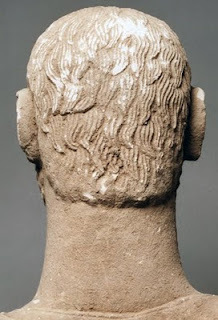 Rear of Roman limestone funerary bust. "Private Swiss collection acquired between the 1930s-60s. Acquired by the present owner at Sotheby's London, July 11th, 1988, lot 83." Who consigned it to Sotheby's? What is the documentation for the Swiss private collection? The Catalogue search was not working when I tried it, but I now managed to trace all the objects I had mentioned in my article and updated it.